Mrs. Yollis' Classroom Blog: Fire Safety With Ellie's Dad! Today we had a special visit from Ellie's dad who is a firefighter for Los Angeles County! Firefighters are men and women who rescue people and save property. His name was Jamie. The special helmet not only protects Ellie's dad, but provides information about what station he is from. Firefighters need to respond quickly when they receive a 911 call. They set up their equipment so they can jump right into it. Notice the boots look like they are lace-ups, but they are not. The are zippered! Ellie's dad said they practice many emergency responses. One thing they practice is to get dressed in less than a minute. Firefighters need to solve lots of problems when they respond to an emergency. They have gear in all of their pockets, special breathing apparatus, flame resistant clothing, tools for shutting off gas lines, and much more. Does anyone remember what other tools he had in his pockets? Part of his equipment included a Personal Alert Safety System (PASS). If ever a firefighter stops moving for 20 seconds, the PASS starts an alert so a firefighter who is in trouble can get rescued. Jamie informed the students that if they are ever trapped in a house with smoke, get down low and crawl to an escape. Because smoke rises, it is easier to see and breath if you are down low. Talk with your family about how to respond if your house is on fire. Where is your emergency family meeting place? Dressed in all their gear, firefighters can be scary to see when you are already afraid. However, he said if you are in a fire, don't hide from a firefighter, they are there to help! Here is Ellie's dad rescuing a young girl. Beverly was very interested in the fire safety information. She stayed awake the entire time! Because she was such a good listener, she got to pretend she was a firefighter! Who is that new volunteer firefighter? After the presentation, several students stayed after to become junior firefighters! 1. Never play with matches. 2. If you are on fire, do not run. Cover your face and STOP, DROP, and ROLL! That will smother, or put out, the fire. 3. Talk with your family about fire safety. HAVE A FIRE ESCAPE PLAN. How do you escape and where is your family meeting area outside? Don't just talk about it, PRACTICE the plan like the school fire drills. 4. If you are in a smoky environment remember to get low, it will be easier to see and breath. Do you have any questions for firefighter Jamie? Have you ever been in an emergency situation and were helped by a firefighter? I had a great time learnng about fire safety with Ellie's dad. My favorite part was when I got to try on the mask and the fire suit. The suit was so heavy it was hard to walk. I too thought it was very fun to try on the fire suit, although the best part for me was holding the ax. I live in a house that is on a hill and when our house was built, we invaded the rattlesnakes' home. The rattlesnakes sometimes get into my backyard because we have a giant slippery rock that they slide down. The way that firefighters help me is by coming to my house to take rattlesnakes out of my backyard. The firefighters come in the big, red truck and they have special tools, a bag and a can. First, they take the head off the rattlesnake with a shovel, and they put the head in a can so it cannot bite. Rattlesnakes can still bite hours after they have died. Next, they put the rattlesnake body in a bag and take it all away in the fire truck. I too had a snake in my yard. Last year I had a baby rattlesnake in my front yard and it was scary because my mom said that baby rattlesnakes have lots of poison in them. Another time I was in Preschool and there was an enormous rattlesnake on the playground at the top of a small hill. Both times, the firemen came to take care of the snakes. I did not know that a snake can bite after it's dead. Were you scared on the inside when you held the ax? 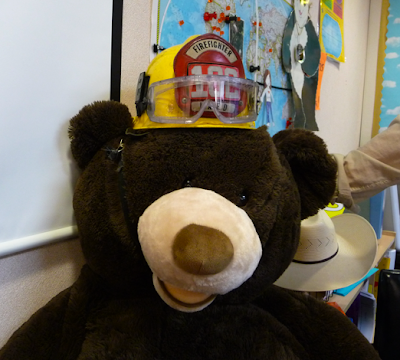 I to had a fun time learning about fire safety with Ellies dad. I would NEVER hold the ax because I am scared that I will hit someone. That would get me into GOBS of trouble.What was your favorite part of the presentation? 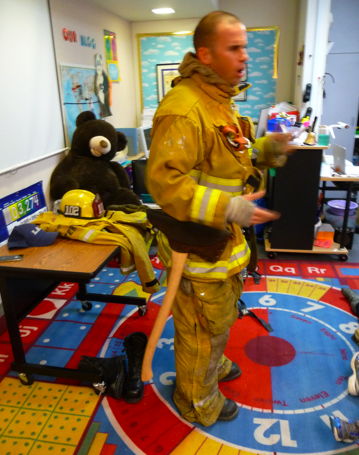 What a great way to learn about fire safety with Ellies dad. I don't ever remember having a real fire fighter come to my school and talk about fire safety. However I do remember having a fire drill where when the school bell would ring the whole of the school would meet at the school oval as a point of safety. I was wondering what does the number represent on Ellies father's fire helmet mean. Great post Mrs Yollis as it is always so important to know what to do in case of a fire. I was very interesting listening to Ellie's father talk about his work. There are so many different problems that they encounter, and they must always be ready! I was amazed at all the tools and equipment he had in his pockets! The number on his helmet is his station number in Los Angeles County. He said that they often work with other stations, and they need to have some sort of identification. On the back of his helmet was his last name. We have fire drills every month. It is the law! I like the idea because with practice, you'll know what to do in a real emergency! I really liked learning about fire safety. The firefighter equipment looked heavy and uncomfortable. I appreciate that firefighters risk their lives to save others. When I grow up I want to be a firefighter. One of our neighbor are a policeman and I see how early he gets up and what time he comes back home. He works over twelve hours a day. I would like to thank Elli's dad for coming to our classroom and showing us how fire safety is important. It is so important to learn about fire safety! Having a guest like Elli's Dad come and talk about it in person makes it so much more real. I couldn't believe how quickly he could get dressed in all that gear. It must weigh a lot. We had to have firefighters come to our house one time because we had a fire in our chimney. I had to get the dogs outside to safety while my husband called 911. Luckily, the fire station is close by and they were able to put out the fire quickly. Another time I got my bathrobe on fire while cooking breakfast. I didn't even know it because my back was on fire and I couldn't see it. My husband quickly put the fire out but it was very scary experience. Learning what to do in those situations and practicing them helps when the real thing ever does happen to you! I love your comment! I think that I would just explode if I found out my back was on fire! I have been in a couple situations with a fire! First, my family and I were going to China Town for the day, but our old dog, Spiffy, ran outside! My brother, dad, and I ran out to get him, but something smelled like fire! I looked up and saw a gigantic fire! By the way I live on a hill so it was very scary. Luckily, the firefighters came and put the fire out! What a relief! I was so so so so so scared because that was the first fire I have ever been in! My second experience with a fire was when I was leaving San Diego. We were about half way home and then we saw a huge fire! I was so scared I didn't want to go anywhere, but we went to eat and continued the ride home. Wow! You have had a few exciting adventures! Luckily they all had happy endings! One time I was sitting in my house with my long haired cat on my lap. There was a lit candle on the table beside the couch. My cat, Sam, was so calm and relaxed. The long, white fur on his tail was waving back and forth. Suddenly, I noticed that the very tip of his tail was on fire! It has swiped past the candle and caught fire. I grabbed him tightly and blew out his tail, but boy could that have been a catastrophe! 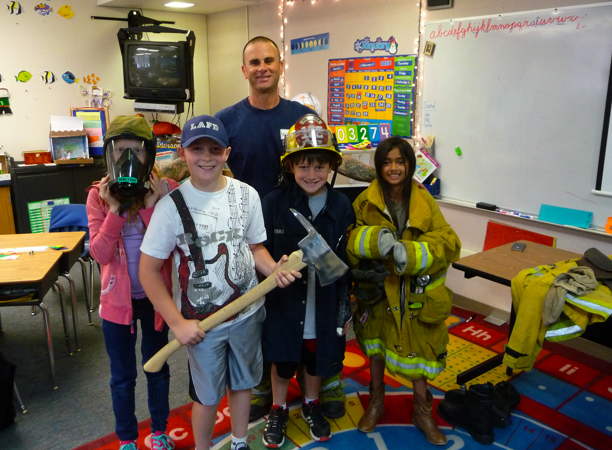 I agree with Mrs Hembree that learning about fire safety is very important. The more you know and practice about fire safety the more likely it is that you will do the right thing if a fire actually happens. In New Zealand our emergency number isn't 911. We call 111. We have a small fire brigade in Reefton. It is all staffed by volunteers. The volunteers have other jobs and come to call outs if they are available at the time. The brigade gets called out more often for traffic accidents than it does for fires. When there is a call-out the fire siren starts and doesn't stop until the first volunteers arrive at the station to turn it off. It can seem very loud in the middle of the night! In Reefton we are very grateful for our volunteer fire fighters because they help to keep our community safe. I also liked learning about fire safety. I also agree that the equipment looked heavy. I recall Mr. Walters said the equipment weighed over 100 pounds! I am pretty sure that he said he weighed 180 pounds and the suit, the oxygen tank, and the ax weighed 20 pounds. The ax weighed 10 pounds, the oxygen tank weighed 20 ponds, and the suit and everything else in it weighed 90 pounds. I really enjoyed Jamie's presentation. My favorite part was when you timed him and Jamie got dressed in less than one minute. My mom says that I need to learn to do that in the morning before school so I can get ready faster. It takes me a lot longer to get dressed, and I am usually the last person to come downstairs for breakfast. I have never been in an emergency, and I hope I never will be. After Jamie's presentation, we had a family meeting and decided to meet outside of our house near the street in case of an emergency. We think it's great that you've had the opportunity to learn about fire safety. It's good that you have a fire fighter parent from your own class. Thank you for sharing about your fire safety lesson. We have had a meaningful discussion about what we should do if there was a fire at home or at school. Mrs Hembree is right - it is important to know what to do in case the unexpected does happen. We talked about how a fire needs fuel, heat, and oxygen. Our class all agree it's important to limit the oxygen a fire receives. We are in New Zealand (like Mrs McKenzie) and twice a year, at the beginning and end of daylight savings, our whole country is reminded to check the batteries on our smoke alarms. I was in your class two years ago and now I'm in fifth grade. We also use the computes a lot and it made me think of your blog. I think it is so cool that you guys got to learn about fire safety. 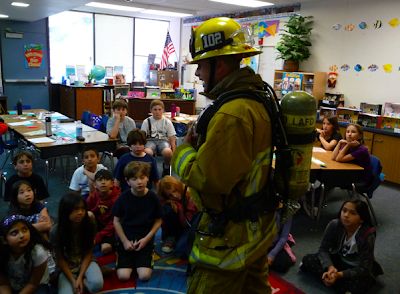 When I was in second grade I learned about fire safety in my class because my friend Tanner's dad is a firefighter. BTW: I will never forget what you taught me about the internet. How nice to get a quality comment from you! I miss you! What kinds of things do you do with computers in fifth grade? What is your favorite activity and what is your least favorite activity? We just got an iPod Touch. Do you have any recommendations? Long time no see so how are you? I like the post about fire fighters and my favorite part about the post is teddy bear fire fighters. I thought that meeting a firefighter in person was very exiting! Being a firefighter is an important job because if there is a fire you might not be able to get out of a house or fire without a firefighter. After reading this post, my family and I discussed our fire plan, if there is a fire in our house. If I did not read this post I wouldn't of ever discussed this with my family. We now have a fire safety plan and meeting spot. What a brilliant opportunity to learn about a very important career in or society. It's comforting to know there are highly trained firefighters there to help us when there's a need. In my town we have two levels of fire fighters. There's the community fire service who take care of fires in the town and bushfire fighters who are called out to fires in the national parks around town. When times are desperate these forces work together and have extra help from our State Emergency Services. Like California, Australia can have some very severe fires in hot summer months. When one area of Australia has sever fires, volunteers from all states are flown in to help. In Australia, our emergency number is 000. In UK I think it is 999, Europe 112 and New Zealand uses 111. It seems to be a good idea to know what the local emergency number is in use when we travel. 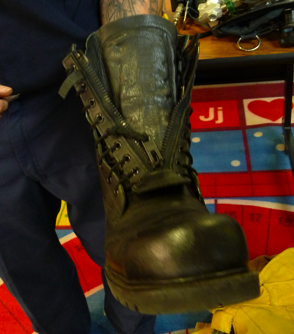 The firefighter's boots remind me a little of my hiking boots. My hiking boots don't go as high up the leg and are real lace up boots but the toes have reinforced steel. I've been told they can withstand a car running over them although I'm not going to try it to find out. Our schools are supposed to have at least one fire drill a term where teachers and students practise escaping fires. All schools display emergency evacuation routes and assembly points. In houses we use the idea of get down low and go because heat and fumes are worse higher up. I also used to teach to feel a door and if it's hot, don't open it as there is a fire on the other side. Practising your emergency plan is as important as learning how to swim or cross roads safely. If we know what to do in an emergency, we can save our lives and the lives of others. I have never been in a situation where a firefighter has needed to help me. I have been in a school where we had to initiate our emergency evacuation plan. Someone had thought it funny to say there was a bomb in our school. Everyone had to make their way to the emergency evacuation area until the police gave as the all clear. The prankster, I think, was caught and faced serious charges for putting in a false emergency call. I just finished watching your post on how to leave a quality comment and I LOVED it. Very fun to watch and very insightful. Not only am I an asst. principal for a high school but I have my own health and wellness blog too. Thank you for contributing to the blog community. It is fun isn't it? Today I learned a great deal about your classroom blog. I was very impressed with all the photography and organization of your blog. You have learned a great deal in a very short amount of time. I would like to learn more about blogging. What do you like most about your classroom blog? Great comment and thank you! It was a lot of fun. Have you ever learned about fire safety? You are correct it was a short amount of time. I thought it was about two hours at first, but it was fun to learn about fire safety. I mostly like the 365 blog. Has your house ever catch on fire? This reminds me of a couple of years ago when my home was in jeopardy in a brush fire. I live on a hillside and the entire community was up in flames. The firemen saved my home. They were amazing. I am so thankful for these heros. Do you have a hero? Did the fire spread on any furniture? Was there smoke coming from the roof? Without firefighters, you or your neighbors could of got injured badly. I want to be a firefighter when I grow up. So, I think that Ellie's dad is my hero because that is what I want to be when I am older. What a great opportunity to learn about fire safety and to meet an actual firefighter! Many of you have shared your favorite part of the presentation, which is really interesting, since not all of us could be there. Now all of you are able to educate your families and help to keep them safe. What do you think is the most important safety tip that firefighter Jamie shared with the class? I enjoyed reading about the day Ellie's father visited your class to help you learn about fire safety. Ellie must be very proud! I know how proud she must feel because we have something in common - my dad is a firefighter too! He would come to my class when I was in third grade (a long time ago) to teach about fire safety. I always looked forward to him coming to my school. Once we went on a field trip to the fire station where he worked and he let us take turns sliding down the fire pole! But the most important part of the day was learning about fire safety and what to do in case of an emergency. I can tell by your pictures that you had a fun day and learned a lot from him. Ellie's dad loves being a fireman. He has been a firefighter for ten years. He went to numerous fire stations. Ellie's dad has been a fire fighter since he was thirty-two. His last station had a fire pole. Ellie's father is working at fire station 102. What fire station did your father work at? Wow! What a great experience! You are all so very lucky to have such a great class, teacher, and supportive parents! Keep up the great work! It looks like you all had a great time with your visitor. Mrs. Yollis came to my class tonight to share all the blogging you do as a class. I am very impressed with all of you. Keep up the good work. Thank you for your wonderful comment.It is so nice of you to give us a compliment.It is kind of funny because my name is Kelly too! What was your favorite part about Mrs.Yollis presentaion? I work at a school in Thousand Oaks and last week the fire fighters / paramedics came to our school to help an injured student. I was really impressed by what a great job these men did helping the injured student! Did Ellie's dad talk to your class at all about first aid and helping injured people? Thanks for sharing all that you are learning with us! What happened to the injured student? Well, the firefighters/paramedics are trained to do this, so they probably have experience. Ellie's dad did not talk about first aid and helping out injured people, but he did say that if there is a fire, look for a fireman because they will help you out. What did the paramedics do? Did they bring the student to a hospital, or helped him at the school? I met your teacher, Mrs. Yollis, at a training today. You are very lucky to be in her class! I wanted to tell you about an experience I had with firefighters. I went into my back yard and there was a REALLY LONG snake on my pool cover! I was so scared the snake would attack me or my dog. So, I called 911 and the firemen came right away. The firemen told me it was a Red Racer snake and was about 5 feet long. I thought what they told me was interesting, but just wanted them to get rid of it. Guess what happened the next day. I had a rattle snake on my front lawn, so the firemen came again! Have you ever had a snake at your house? It's a scary thing. Wow,I never had a snake in my backyard, but it sounds scary! I also had an experience with the firefighters. It was when my dad almost stopped breathing. I was so scared, but they saved him. I was happy that my dad was alive, but I was thankful, too! How do you like blogging? Do you think you will start? Great comment! It was a lot of fun to meet a real firefighter in my opinion. I would never want to hold the ax because of the same reason. I saw the ax and I said I want to hold it, but then I imaged that it would slip out of my hands and fall on someone’s foot! That would not be fun, unless you were playing a pirate game, and your team was about to lose and then you did it on the last player they had left. My favorite part about learning from Jamie was when he showed us how he would carry a human if they were knocked out. When that happened Ellie must have been on the Simpson’s Ride at Universal Studios. How many pounds would you say the whole uniform is? We have a fire safety plan at our house. If there is a fire, then we try to get to our parents. If we can't then we have to exit the house through a door or window and wait at our neighbor's house. My parents will be in charge of rescueing our pets. In our garage we have fire extinguishers to protect us from fire. They are only for my parents or a grown up to use. We also enjoyed learning about fire safety, but we enjoyed it more when we saw it in person. He did go really fast. Our class actually timed him and he took about forty seconds. We are very grateful to Jake Taylor for keeping us involved in your class blog. It looks like you had a very exciting and informative day learning about fire safety and we were happy to read about it here. I am also grateful for being involved in our class blog. I did get a very exciting and informative day learning about fire safety. I look forward to commenting to you more. We are in Auckland New Zealand and are Year 7 and 8. My name is Sarah Webb and I am a EDM 310 student at the University of South Alabama. I love all the pictures and the video in this blog post. I can remember learning about fire safety when I was in grade school. The way we were taught about fire safety was through videos. 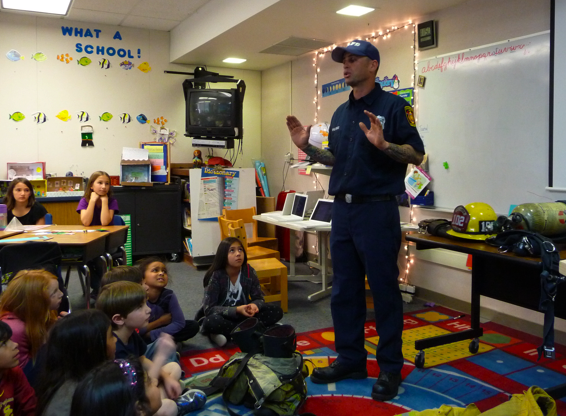 However, I think having an actual firefighter come to the class really has more of an impact on the children. After reading your post I went through and read the comments your students left. 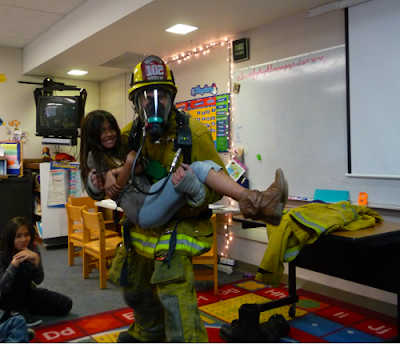 It seems like your students learned a lot and really enjoyed Ellie's dad coming in to show them what firefighters do. My name is Mckinley Kennedy and I am a student in Dr. Strange's EDM 310 class at the University of South Alabama. I really enjoyed reading the blog about having Ellie's dad come to your class. I have always been really interested in learning everything that firemen do. I remember back when I was in grade school and we visited a Firehouse. It was a real experience to see the trucks and where they have all their equipment. It is so great that Ellie's dad could share everything he knows with your class. I loved watching the video to see how long it would take to put the equipment on. You have to be really fast to put all that on. Keep up the great work and I really hope to read more about what all your class is up too. Thank you for sharing. 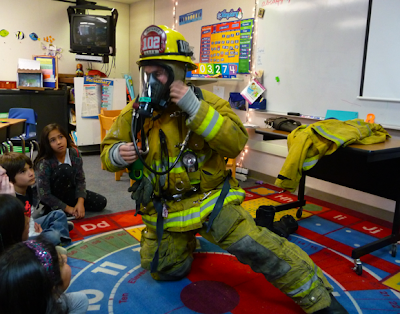 it must've been really amazing having a firefighter come into your classroom and seeing him getting dressed in less than a minute! No I haven't been saved by a firefighter before, but has Mrs Yollis or any of Mrs Yollis's class? I'm a student in EDM310 at the University of South Alabama. I loved the classroom blog post. I learn something my self from the information you and the class has provided. It is very important to always be ready and alert when it comes to a fire. My son is three and he already know how to dial 911 if there is anything wrong and I cannot make it to the phone. This is a good way to teach students not to play with matches or fire because it can be very dangerous. I will love to do something like this with my students in the future. Thanks Mr. Jamie for the tips and advice. Keep up the good work. My name is Emily Jeanminette and I am a student in EDM 310 at the University of South Alabama. This was such a fun read. I remember being in 3rd grade and absolutely loving when the fire department would visit! They brought rescue dogs, equipment and all the bells and whistles! I remember forming an escape route with my family in case there ever was a fire. I learned so much from their visits and always had a great time. 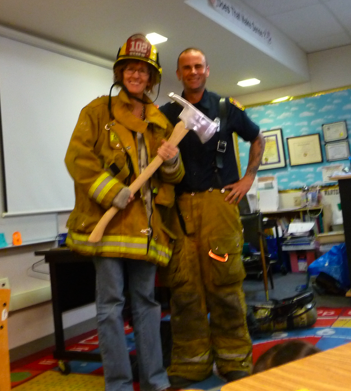 I can't wait to teach and have the fire department visit my school!